Lead author Dr Matt Carmichael from the University's Schools of Chemistry and Geographical Sciences, said: "With the same climate models used to study future climate change, we studied how a doubling of carbon dioxide concentrations would affect rainfall patterns on a world with Eocene geography. "This increased the overall global precipitation – warmer air holds more water. But it also changed the pattern and frequency of extreme events. "Although we have not investigated them here, it is very likely that our results are translatable – because the physics that underpins them remains the same. 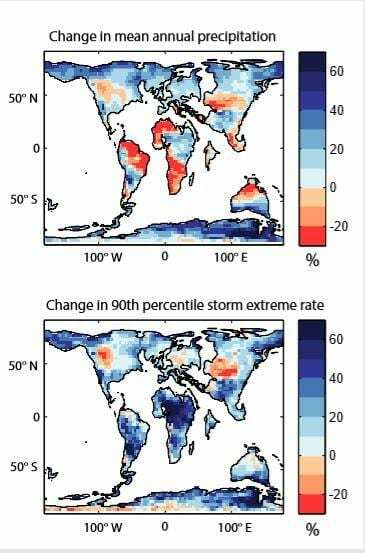 Thus, the collective body of research confirms that global warming in the past and the future will be associated with more 'flashy' rainfall, with implications for flooding and water management." Professor Pancost said: "Past climate has lessons for our future. Not only do the models show evidence for more intense rainfall events – with all of the implications that entails – but they are consistent with all of our other data.